Washington, DC— The Institute of Museum and Library Services announced today that the agency's annual Performance and Accountability Report (PAR) is now available, showcasing key accomplishments for FY 2018. 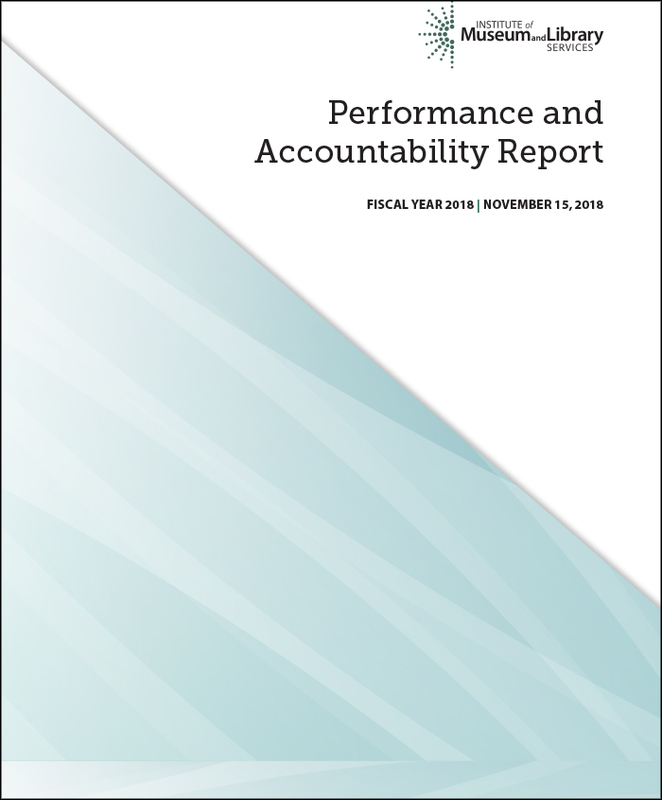 The report includes an independent financial audit and describes agency activities and achievements from October 1, 2017, to September 30, 2018, as required by the Office of Management and Budget. In January, IMLS launched a new Strategic Plan 2018-2022, Transforming Communities. The strategic goals, which will shape the agency’s work for the next five years, are to promote lifelong learning, build capacity, increase public access, and achieve excellence. The agency’s grantmaking was enhanced by an additional $9 million Congressional FY 2018 appropriation. The Grants to States program, which provides population-based funding to State Library Administrative Agencies, received a $4.7 million increase. The agency was also allocated a $3 million budget increase for museum programs, and this allowed us to fund additional new, innovative, and high quality grant proposals for this fiscal year. State Library Administrative Agencies reported “civic engagement” as a growing priority in the 2018-2022 plans submitted to IMLS; the agency saw an increase of 74 percent for civic engagement goals, as compared to the 2013-2017 plans. IMLS developed two new grant initiatives to support small, rural libraries and museums: Accelerating Promising Practices for Small Libraries, and Inspire! Grants for Small Museums. A record number of African American History and Culture grants were awarded: a total of 26 projects in 18 states, with 11 of the 26 receiving IMLS funding for the first time. In response to needs identified by Native American communities and the library field, the agency increased the grant award for Native American Library Services Basic Grants from $6,000 to $10,000 per eligible tribe. This program supports tribal libraries by providing funds for library operations and cores services. A new study, Understanding the Social Wellbeing Impacts of the Nation’s Libraries and Museums, was launched in August 2018 to better understand the conditions under which museums and libraries contribute to wellbeing in the communities they serve. The research will focus on the essential roles of libraries and museums in their communities, and will help these institutions demonstrate the impact of their programs and services. The agency is funding OCLC, Inc., to conduct a research study in partnership with the American Library Association’s Public Library Association to examine how libraries are working with their communities to respond to the opioid crisis. For more information about IMLS’s accomplishments in FY 2018, the full report is available on the IMLS website.